Lanikai Beach is dog-friendly, so if your pup is on island with you, take him (and his leash!) with you! 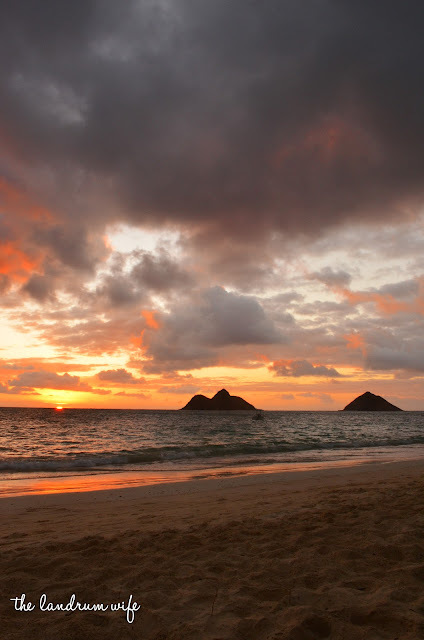 As with all Hawaiian beaches, the beach is open to the public and yours to explore, as long as you don't trespass on private property and only use the designated beach access passageways. 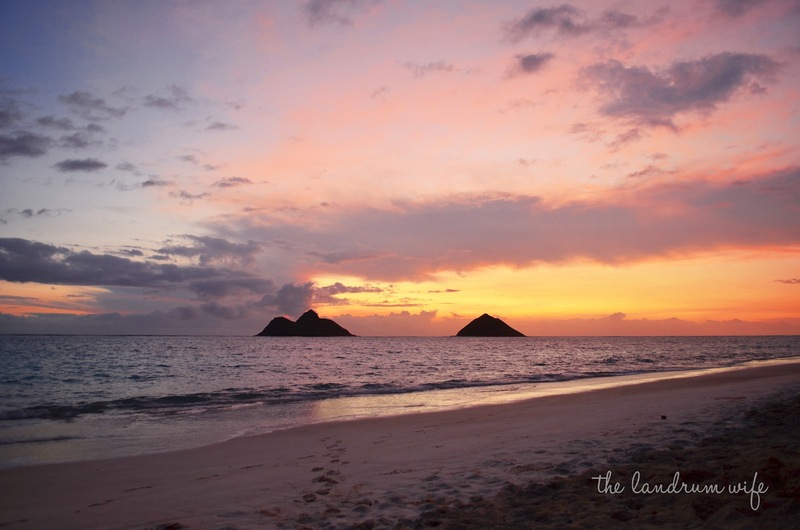 There is also obviously no charge to visit Lanikai. 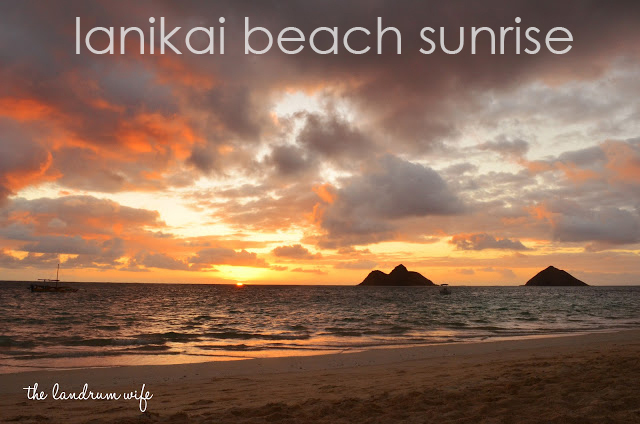 Spend the day here snorkeling, kayaking out to the Mokulua Islands, swimming, or just lying on the beach and getting some sun! 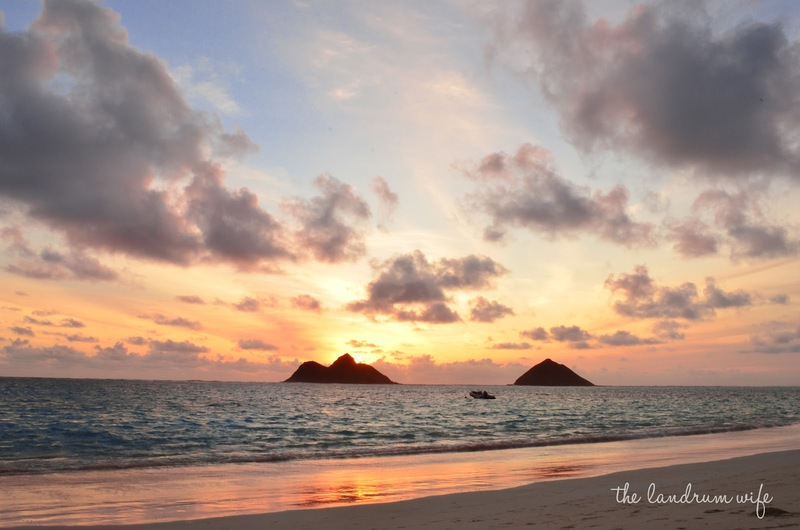 "Half a mile of sparkling sand, palm trees swaying over a white beach, lush tropical plants, and endless sunshine make Lanikai one of Hawaii’s most scenic beaches. The shore is protected by a nearby coral reef, which keeps the surf relatively calm. The water is always deep green and postcard-perfect." 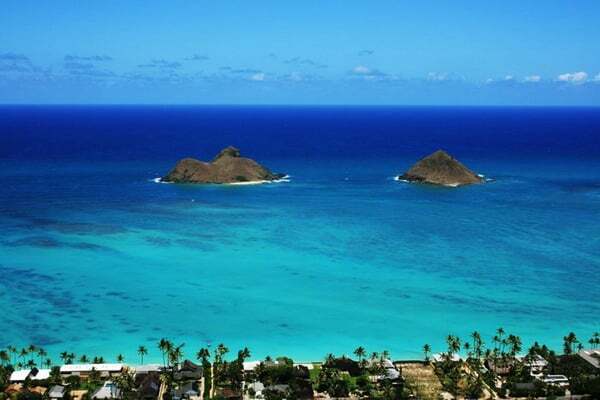 The crystal-clear blue-green waters, powdery-fine white sandy beach, and breathtaking view of the Mokulua Mountains are among the many assets that make Lanikai so stunning. Mr. L and I have been lucky enough to watch this beautiful sunrise three times so far -- once with our friend Joe, once on Easter morning, and once with our friends Shawn and Tayvia. It's been gorgeous each time, and it's something that we hope to bring all of our family and friends to soak it all in when they visit! I love how different the skies, water, and sunlight look each time we go; every time is unique unto itself, which is pretty fascinating. Sharing this experience at Lanikai has become a very special activity for Mr. L and I, so we will for sure be going many more times before we're forced to part ways with this beautiful island. Um, hello, is that water GORGEOUS or what?! Where's your favorite place to watch a sunrise or sunset? This might be one of those thing I'll have to experience without the kids or husband, I don't think they would appreciate it! Still haven't gotten over to the windward side of the island yet! Did you have to take a flash light with you in order to find the beach? Since we will have never been there just wandering if it will be easy enough to find in the dark?